I guess I'm outdated but, it's never too late to learn. Of course, my knowledge about recognizing whales as the largest living thing is long gone since the time I wrote a post conerning the gaint sequoia. 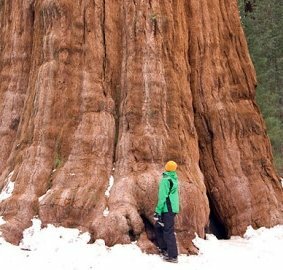 In terms of size and sheer volume, the giant sequoia (Sequoiadendron giganteum) known as General Sherman located in California's Sequoia National Park, is a monster of a tree measuring 52,508 cubic feet. It was the world's largest tree and living thing as at then. Here's a new record breaker. 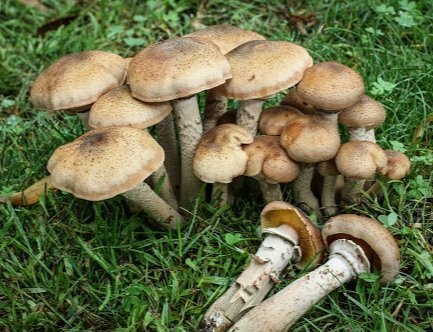 The largest living organism is a species of fungi; a humongous fungus known as Honey fungus (Armillaria solidipes) previously known as Armillaria ostoyae. 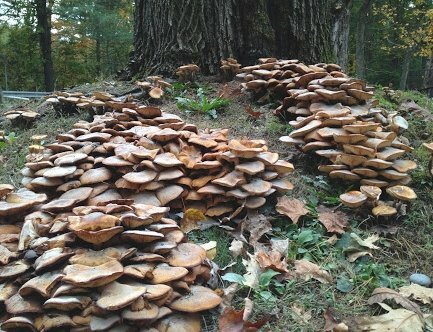 A particular honey fungus covers about 10 square kilometres in Oregon's Malheur National Forest and is more than 2,400 years old. It is estimated to cover over 2,385 acres of land. Woah! The honey fungus is a genus of parasitic fungi live on trees and shrubs. They attack and kill the roots of many woody and perennial plants depriving them of their nutrients for their own growth and also decay the dead wood left. It is nicknamed as a serial tree killer. Fungi have a root-like system known as mycelia which functions in drawing nutrients and water from the soil and other plants they infest. These mycelia fuses with one another to form a large network and make the mass function as a single organism. It is with this property scientists have agreed to honour this honey fungus with the title of the largest living organism. To buttress their claim, samples were taken from all the known infected trees in the area and their fungal DNA were compared and found to be the same.